Alaska Outdoors small group (only 10 max) adventure tours explore Alaska’s world famous National Parks and protected areas. Our trips adventure by day, and camp outdoors by night, with an emphasis on active, experiential travel. At each of our destinations you will have the opportunity to customize you’re trip by choosing from world class outdoor activities. Hike on a glacier, view marine wildlife and a calving glacier on a day cruise, sea kayak amongst ice burgs, whitewater rafting, world class fishing and more- the choice is yours. Our trips offer an enriching and very economical adventure travel option in Alaska and are outstanding value! Our camping and multi sport tours have been designed to highlight Alaska’s intact ecosystems, abundant wildlife and adventurous day tours located near and within Alaska’s national parks and protected areas. We camp at least two nights at most locations, with occasional hotel or cabins thrown in, allowing us time to get to know these areas and to participate in a variety of different sightseeing and adventure tours. The Classic Alaskan Tour explores some of Alaska’s most famous National Parks and protected areas. First we visit the 150 million acre Kenai National Wildlife Refuge, an area well known for its beauty, salmon, and wildlife. Next we’re off to Kenai Fjords National Park and one of the richest marine wildlife areas on earth where massive glaciers carve ice into the sea. Finally, we’ll take in the crown jewel of the National Park system Denali National Park, home of the largest mountain in North America and abundant wildlife. Our Classic Alaskan Tour is one of our most popular tours. Wildlife / glacier cruise, whitewater and scenic river rafting, dog sledding, world class fishing, horseback riding, flight seeing, sea kayaking, Mt. biking, fly out hiking, and more! The Wildland Glacier Tour is an inspiring Alaskan journey into the heart of one of the largest protected wilderness areas on Earth. First, we’ll explore Hatcher Pass/ Independence Mine State Recreation area followed by Alaska’s largest road accessible glacier for a walk onto its vast snout. We’ll travel deep within Wrangell St. Elias National Park, part of a World Heritage site, exemplifying the essence of Alaska’s wild spirit. Next, we’re off to Valdez and Prince William Sound, a temperate rainforest often referred to as the “Little Switzerland” of Alaska. Mountains, glaciers, and the ocean combine to create a world class destination. Finally, we’ll board the Alaska Marine Ferry for a cruise across Prince William Sound along the base of the towering Chugach Mountains. The Wildland Glacier Tour captures the heart of all those that make the journey. Glacier hiking with crampons, ice climbing, sea kayaking to a glacier, flight seeing, wildlife/glacier cruise, historic mine tours, and more! 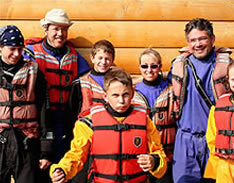 Our Classic Family Tour is a similar version of our Classic Alaskan Tour but is reserved for families travelling with children 8 and over. First, we'll head north to Denali National Park, home of the largest mountain in North America and abundant wildlife. Next we'll explore the glaciers and wildlife in Kenai Fjords National Park. Finally, we'll spend two nights deep in Kenai National Wildlife Refuge, an area known for its beauty and abundant wildlife. Young and older alike will appreciate the experiential journey of this tour and the lasting memories of quality time spent together. 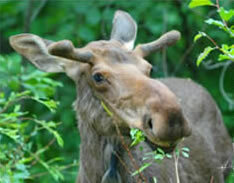 Our Wildlife Tour explores four of Alaska’s wildlife rich parks and protected areas; the 150 million acre Kenai National Wildlife Refuge; the marine rich Kenai Fjords National Park; Denali National Park- home to Alaska’s most famous terrestrial mammals; and the Tangle Lakes region, a world renowned birding destination. 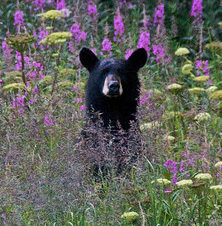 Your chance of observing and photographing wildlife is outstanding at these locations. Look for bears, whales, sea lions, moose, caribou, Dall sheep, fox, Bald Eagles, swans, and lots more. Please Note: This itinerary may operate in a slightly different order depending on ferry schedules and local conditions. All destinations of the itinerary will be the same, only the destination order will be altered. For those with wildlife viewing as a significant objective, and with only 10 days to travel in Alaska, this trip is a fantastic wildlife adventure. World class ocean and river fishing, river rafting, sea kayaking to a glacier, horseback riding, glacier/wildlife cruise, flight seeing, dog sledding, mountain biking, river kayaking, fly out hiking, and more! The Classic Alaskan Tour explores a classic mix of Alaska’s famous National Parks and protected areas and adventurous activities. First we visit the 150 million acre Kenai National Wildlife Refuge, an area well known for its beauty, salmon, and wildlife. Next we’re off to Kenai Fjords National Park and one of the richest marine wildlife areas on earth where massive glaciers carve ice into the sea. Finally, we’ll take in the crown jewel of the National Park system Denali National Park, home of the largest mountain in North America and abundant wildlife. The Classic Alaskan Tour is one of our most popular tours. The Wildland Glacier Tour is an inspiring Alaskan journey into the heart of one of the largest protected wilderness areas on Earth. First, we’ll explore Hatcher Pass/ Independence Mine State Recreation area followed by Alaska’s largest road accessible glacier for a walk onto its vast snout. 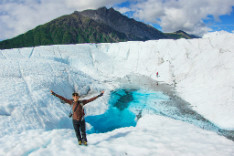 We’ll travel deep within Wrangell St. Elias National Park, part of a World Heritage site, which exemplifies the essence of Alaska’s wild spirit. Next, we’re off to Valdez and Prince William Sound, a temperate rainforest often referred to as the “Little Switzerland” of Alaska. Mountains, glaciers, and the ocean combine to create a world class destination. Finally, we’ll board the Alaska Marine Ferry for a cruise across Prince William Sound along the base of the towering Chugach Mountains. Whitewater and scenic river rafting, sea kayaking to a glacier, glacier hiking with crampons, Mt. biking, glacier/ wildlife cruises, dog sledding, ice climbing, world class fishing, flight seeing, fly out hiking, and more!